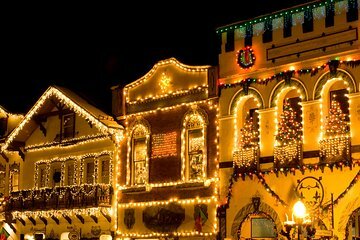 Escape to the quaint Bavarian village of Leavenworth, nestled deep in the snowy Cascade Mountains, for this annual Christmas Lighting Festival on an all-day tour from Seattle. This fun-filled event is overflowing with holiday cheer — like carolers strolling through the village, the scent of roasted chestnuts in the air, sledding at Front Street Park and so much more. The highlight is watching a half million Christmas lights come to life during a special ceremony at dusk. De manhã, encontre-se no Museum of Pop Culture, no centro de Seattle, para embarcar em um ônibus confortável para começar essa jornada de férias. A partir daqui, é uma viagem panorâmica de 3 horas a leste da cidade de Leavenworth, no coração das belas Montanhas Cascade. Esta pitoresca cidade bávara se transforma em uma vila de luzes neste momento a cada ano, atraindo visitantes de perto e de longe para testemunhar o Festival de Iluminação de Natal. Há muita música ao longo do dia, de cantores e coros de sinos a uma banda de alto nível da Guarda Nacional do Exército Dixie, artistas solo e alguns dos melhores colégios e corais profissionais no noroeste do Pacífico. Um passeio pela cidade dará as boas-vindas ao cheiro de castanhas assadas no ar. Assista os sledders no Front Street Park. Pare na Tenda Gluhwein para tomar vinho quente e cidra. Faça um passeio de carruagem de inverno puxado por cavalos. Compre em qualquer número de lojas temáticas e desfrute de autêntica comida alemã de restaurantes locais e carrinhos de rua. Existe realmente algo para todos. Ao entardecer, a aldeia explode em um mar de cores, como meio milhão de luzes ganham vida em um brilho comemorativo. Então é hora do relaxante retorno a Seattle com memórias de férias que durarão a vida toda. Aviso: Este tour sazonal só funciona em fins de semana selecionados durante o mês de dezembro. Had a great time in Leavenworth. A few items I would like to state. Since it’s a higher priced trip to Leavenworth. Instead of stopping at Safeway coming/going maybe set up with a bakery or other type venue.The driver shouldn’t use personal opinions about Amazon stick to facts. It was uncomfortable. I am very disappointed about this experience... to only have 3 hours in Leavenworth and 12 hours total in the bus was not my way of having this experience. I understand the weather was a factor, however they should've been more prepared for the weather. Thankfully another passenger helped. The Viator tours I've taken in Las Vegas or Seattle have always been a great experience. 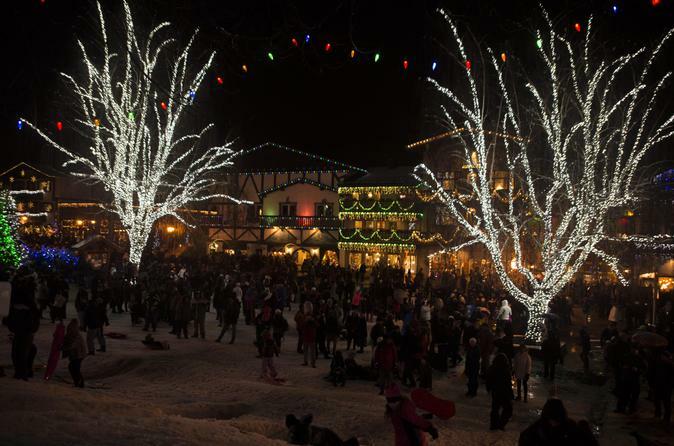 Since the town of Leavenworth only has its Tree Lighting on three Saturday's in December, I was worried that the trips would sell out, but luckily it didn't, and having a small minibus made it easier for our driver, Joe, to navigate the passes vs. the large full-size tour buses. There was more than enough time to tour the city and take a sleigh ride, have lunch, and shop. Highly recommended when the weather conditions (ie, snowy/icy roads) can be a challenge for anyone. Lots of rest stops along the way for breaks and food.